So, if I add veggies to pasta, it is ok to eat a whole bowl of it without feeling guilty, right? I tried this using regular pasta and also using Modern Table‘s Lentil pasta which I had left over from my Lentil and beet pasta recipe. They were both good and I felt no guilt devouring a plateful of each. These pasta are ridiculously simple to make. 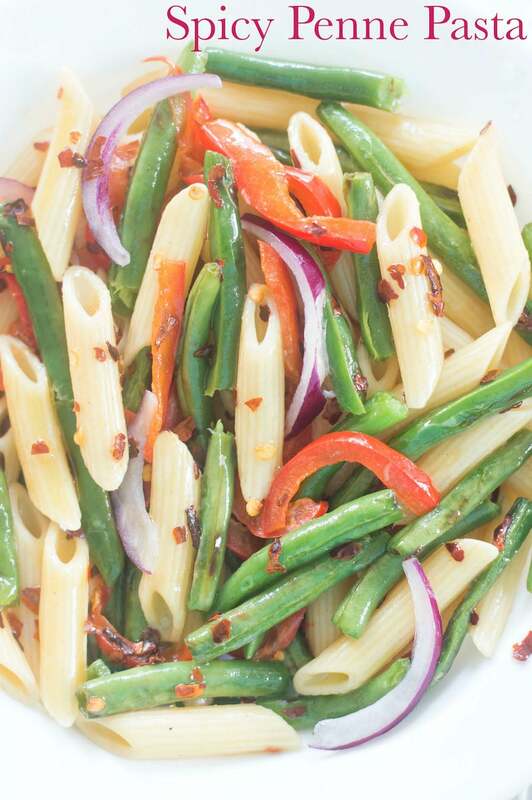 It is just a matter of roasting the green beans and bell pepper in the oven, while you cook the pasta on the stove. When both are done, plate them and top with a simple lemon vinaigrette + red pepper flakes!! And as they say in Italy, Finire!! I used my simple lemon vinaigrette recipe as a dressing for this pasta. Feel free to add your version of a simple vinaigrette. This pasta recipe works great as a lunch recipe or you can eat it as a side dish. 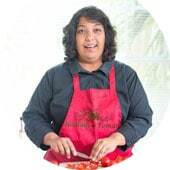 It is a comfort food for all regardless of whether you are vegan, vegetarian or even an omnivore! Once in a while, we all could use a little spice in our life. 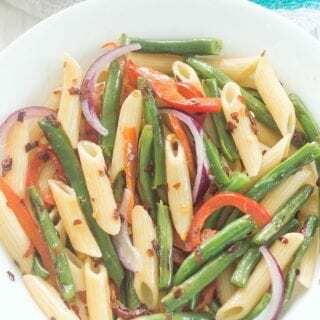 Green beans have slowly made a place for themselves in my taste buds and I find myself using them extensively in my daily diet lately. Recently, I made my green beans and potatoes. That is one of my favorite hearty meals ever. Last year, these green beans ended up in a tangy yogurt sauce which were perfect for the holiday season. One of my favorite spicy recipes is this spicy jalapeno smoothie. Check it out and let me know what you think. What kind of pasta would you add to this recipe? 7) Place the veggies in the oven and roast the veggies for about 7-10 minutes until they green beans start to brown. P/S: You can always saute the green beans and red bell peppers on the stove top instead of roasted them in the oven. Use whichever method works better for you. 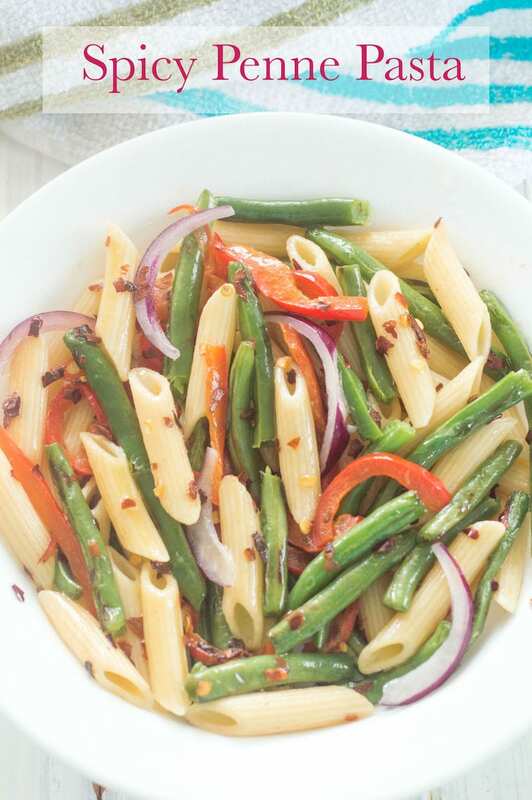 8) In the same bowl from step 3 above, add the cooked pasta, green beans and red bell peppers. Drizzle with 2 Tbsp of your favorite lemon vinaigrette or use my lemon vinaigrette recipe. Add 1 tsp of red pepper flakes and mix well. If you like this penne pasta recipe, try penne pasta with mushrooms and spinach. Roast the veggies for about 7-10 minutes until they green beans start to brown. In the same bowl from step 3 above, add the cooked pasta, green beans and red bell peppers.